While your dinner heats you have time to relax, the kids can finish their homework and everyone can sit down together and enjoy a little quality time. 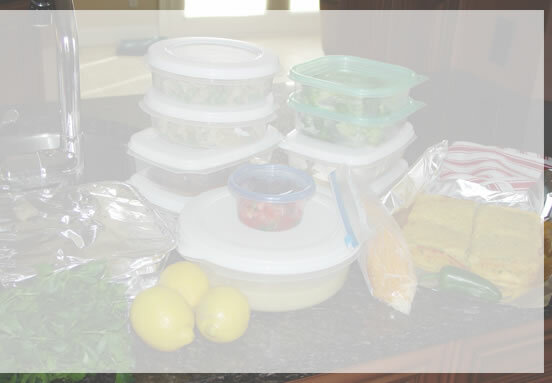 No more packaged, frozen dinners, take out meals or time wasted at a restaurant. I take care of menu planning, shopping, cooking and clean up. Think of the hours that will save you every week! Your menu will be personalized based on a detailed food questionnaire that will be covered in your consultation. All of the quality ingredients will be purchased the day of your cook to insure freshness. And, you will receive a detailed menu with reheating instructions. This service is perfect for professional couples, new moms, busy families, medical recovery individuals, senior citizens and anyone who loves to eat but hates to cook!